HWPH AG - Acciones antiguas - Arrah-Sasaram Light Railway Co. Ld. Arrah-Sasaram Light Railway Co. Ld. 05.07.1910, 5 Shares of 100 Rupees, #428, 20,2 x 25,7 cm, grün, beige, Knickfalten, Randeinrisse, stempelentwertet. 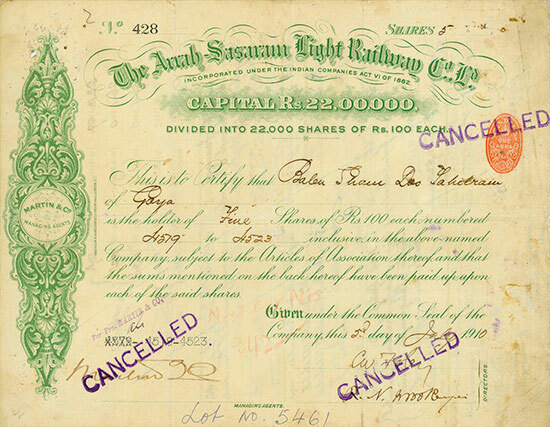 5 July 1910, 5 Shares of 100 Rupees, #428, 20.2 x 25.7 cm, green, beige, folds, tears, cancelled by stamps.